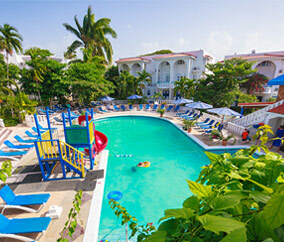 Your all-inclusive vacation in Jamaica at the Franklyn D. Resort & Spa is truly the family experience of a lifetime. Our staff is naturally warm, entertaining, friendly, and eager to please as they share with you Jamaican culture and the island way of life. Hands-down the best family resort in Jamaica (and the only to offer nannies), your kids will engage in wall-to-wall exciting activities, particularly at the Yellow Bird Kids Club. All the while, Mom and Dad will get much needed R&R, making this the premier family resort destination of its kind! Members will receive up to 5% cash back savings, plus a one-category room upgrade upon check-in (based on availability at the time of check-in). FDR is the best all inclusive family vacation destination in the world. From friendly, caring and interactive staff, including your family’s own Vacation Nanny, our all-inclusive vacation packages include the best of food, drinks, accommodations and activities for families. Rates subject to availability and pricing at time of booking. Promotions and pricing are limited and may be changed or discontinued at any time. Certain restrictions may also apply. Although every effort is made to ensure the information contained here is correct, on occasion, typographical errors can occur, for which we are not responsible. Click here to learn more about all the benefits of membership! You have already Signed Up for Newsletter! We faced issue while Signing Up for Newsletter! Benefits are available exclusively to club members only when reserved through the club. Promotions and prices contained within are limited, and may be changed or discontinued at any time. Restrictions may also apply. Although every effort is made to ensure the information contained herein is correct, on occasion, typographical errors occur, for which we are not responsible. Travel + Leisure Family Club reserves the right to change merchant offerings and partners at any point. Offers/partners are subject to change or may be discontinued. © 2019 TI Inc. Affluent Media Group. A part of the Meredith.com sites. All rights reserved.